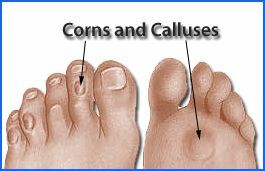 Are Your Corns and Calluses Causing You Pain? Those Days Are Soon To Be Over! Corns appear as a thickening of the skin on the toes. Hard corns are usually located on the outer surface of the little toe or on the upper surface of the other toes. A soft corn occurs between the toes and is kept soft by the moisture in this area. A callus is more diffuse area of thickening and does not have the focal point of the corn. Calluses most commonly occur on the bottom of the foot. Corns and calluses are both formed by too much pressure. This pressure can be from tight shoes, toe deformities such as hammertoes, and bony prominences. Biomechanical or gait abnormalities can cause pressure under different areas of the bottom of the foot, causing calluses to form. Your Houston podiatrist will provide a proper assessment of the corn or callus to determine its cause and implement a plan to manage the pain and pressure. Options to manage and treat the lesions include regular maintenance visits to keep the corn or callus reduced, the use of padding, changing shoegear to minimize pressures, and the use of orthotics to relieve the pressures beneath the foot. When pain from a corn or callus is unrelenting, surgical correction of the bony prominence may me necessary.